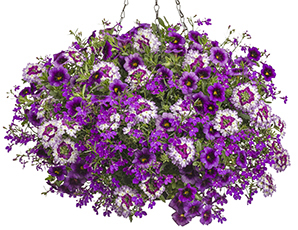 Combination Planters & Hanging Baskets will be available for pickup April 27th 2019! Covered head to toe in luxurious shades of purple, the Proven Winners monochromatic Sparkle and Glow recipe will blend easily into any color palette you choose this year, from rich jewel tones to calming neutrals and everything in between. Though each blossom offers unique color patterns that you’ll appreciate up close, this recipe is equally impressive when viewed from a distance. *This item will be ready for pick-up April 27th 2019. Please bring your emailed confirmation to our Information Booth & we'll load it up for you!